Download Catalog #33 PDF: Click to download (requires Adobe Acrobat Reader). Printable in B&W or color! 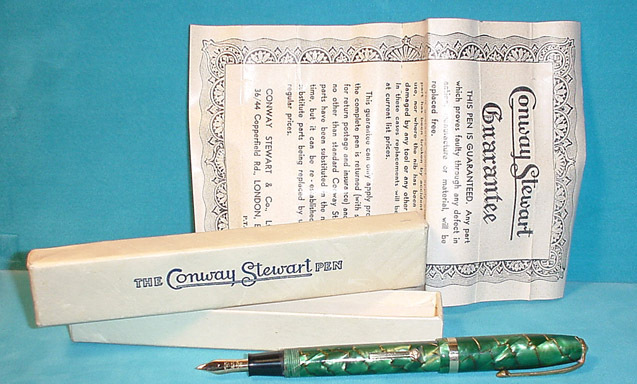 The Conway Stewart Pen Company was founded in 1905 by Thomas Garner and Frank Jarvis, both of whom had prior experience in the pen industry. Their mission was to create a economical pen which would appeal to the masses (similar to what Richard Esterbrook did in the USA). They fulfilled their mission well! 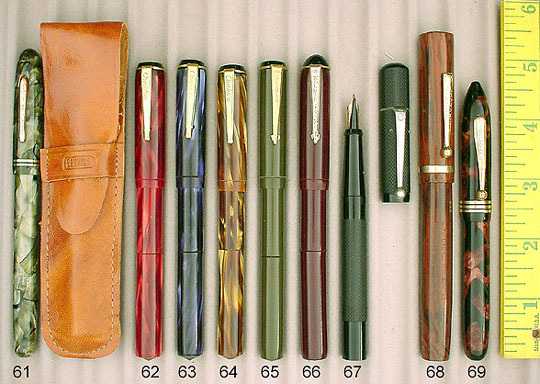 Starting with eyedropper fill pens, they progressed to lever fillers, button fillers, and even dabbled in some other mechanisms. Lever fillers were by far their most prolific product. 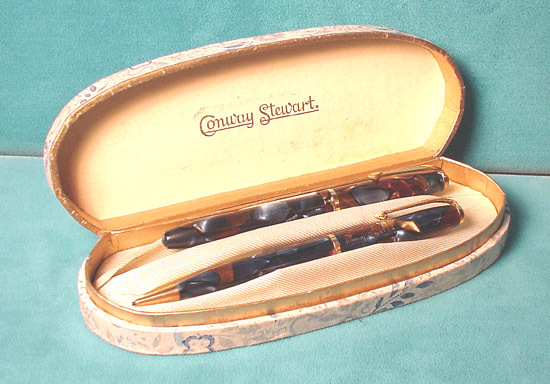 Trademarks included “Conway Stewart,” “Duro-point” and “Dinke.” Like Sheaffer in the USA, Conway Stewart was the first pen company in the UK to introduce color (1924). They produced an extremely large number of colors and patterns, and a vast number of models. The Company prospered until the Depression, but weathered it successfully and prospered once again afterwards, as domestic and foreign sales continued to grow. 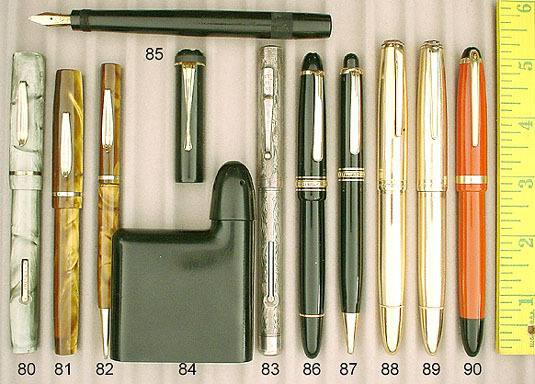 Once again following the US manufacturers, in the early 1930s they streamlined the shape of their pens. They survived the bombings of World War II and continued their success. 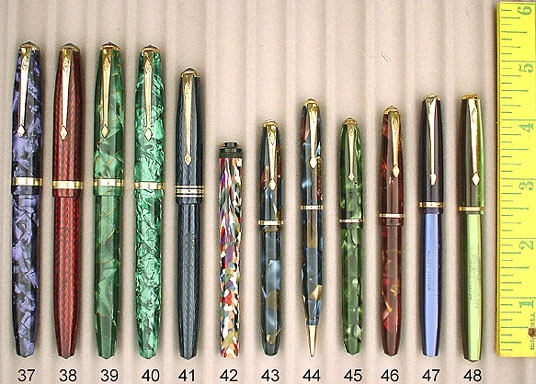 They produces pencils to compliment their fountain pens and, in 1957, introduced a ball point pen, which failed due to unreliability. Their high quality and relatively low cost, combined with a startling array of models, patterns and colors, make Conway Stewart extremely popular to collect today. 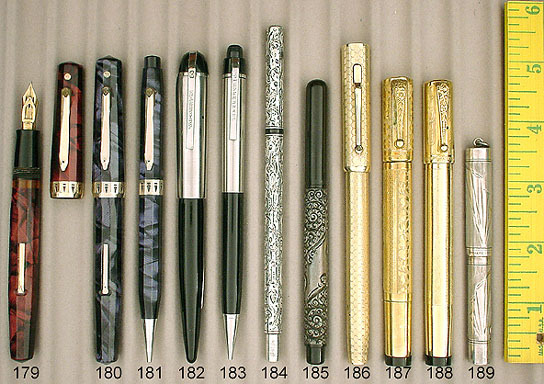 Most striking are their pens with gold veining, the herringbones and the cracked ice patterns. 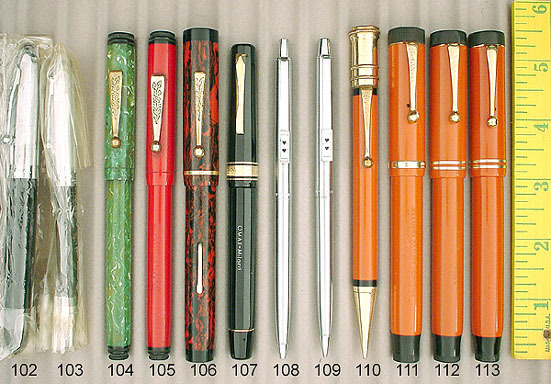 The downturn of the company started in the 1960s, with the inability to compete with the more modern designs, such as the Parker 51 and Sheaffer PFM. To try to survive they produced a very inexpensive (and poor quality) cartridge fill pen. They officially went out of business in July 1975. 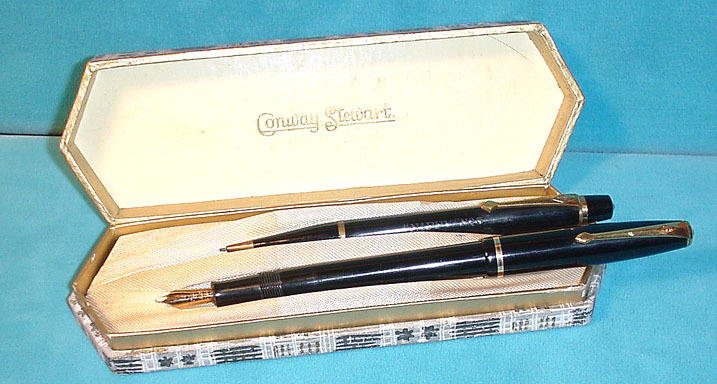 1951 Conway Stewart #12 LF Set in Black. GFT. Extra-broad, italic nib. New-old-stock, mint in original box (Photo). 1951 Conway Stewart #28 LF in Tiger’s Eye. GFT. Medium-broad nib. A tad of brassing to the lever, otherwise near mint. 1951 Conway Stewart #28 LF in Blue Pearl Marble. GFT. A tad of imprint wear (fully readable) otherwise near mint. Medium nib. 1951 Conway Stewart #55 LF in Blue Pearl Marble. GFT. Note the wider middle band. Medium-broad, oblique nib (shaped like left foot). Just the slightest amount of imprint wear, otherwise near mint. 1955 Conway Stewart #58 LF in Black. GFT. Medium-broad, flexible nib. A tad of imprint wear (fully readable), otherwise near mint. 1956 Conway Stewart #85L LF in Green Pearl with Gold Veins (beautiful). GFT. Medium, flexible nib. Mint in original box with guarantee-instructions. 1951 Conway Stewart #540 LF ring-top in Red, White, Blue, Green, Orange and Purple random pattern (incredible)! GFT. Near mint in original box (Photo). 1951 Conway Stewart #570 Dinkie LF in iridescent Green Pearltex. GFT. Medium. Mint with original label. 1905 Autofiller #4 Twist Fill in BCHR. To fill, remove blind cap and twist the knob which is attached right to the bladder. 14K, signed Autofiller nib (small crack emanating downwards from the breather hole). Medium, triple-flexible nib. Wonderful, crisp chasing and imprint. 1937 Camel #6 size Button Fill in Black. GFT. A high quality, highly collectable brand, which is hard to find! Fine, flexible nib. 1918 Conklin #25 Crescent Filler in BCHR. GFT. 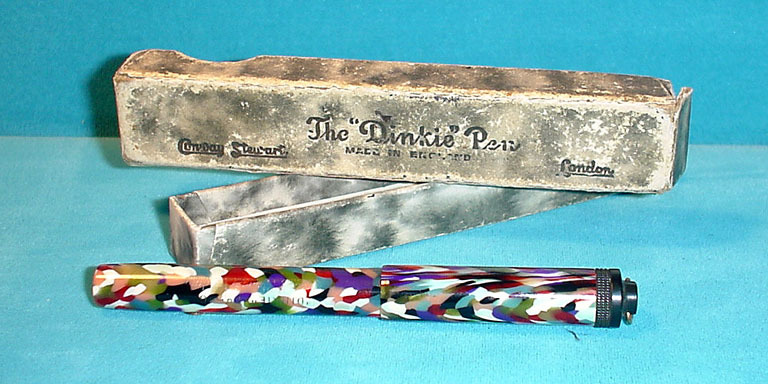 Medium, triple-flexible nib. Just a tad of brassing at the upper and lower humps of the clip, otherwise near mint. 1918 Conklin #20 Crescent Filler in BCHR. GFT. Immaculate condition with crisp, deep chasings. Fine, triple-flexible nib. 1925 Conklin Endura Jr. in Rosewood. GFT. Trim is perfect, but the imprint is weak (reflected in the price). Fine point. 1945 Conklin Minuteman #3 size Plunger Fill in Red Pearl. GPT. 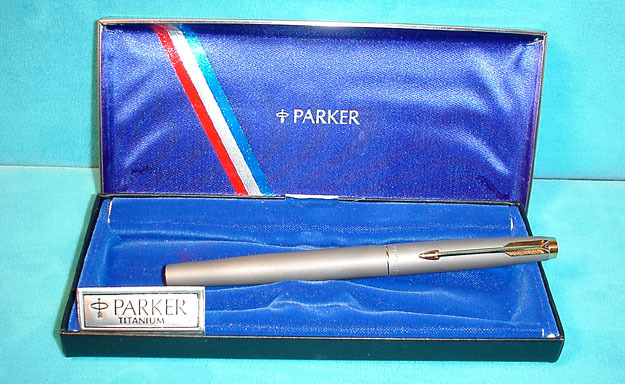 A low quality pen, indicative of Conklin’s very late Chicago production when it was on the verge of going out of business. These plungers on these pens, while completely original, do not work and are too poor quality to be restored. 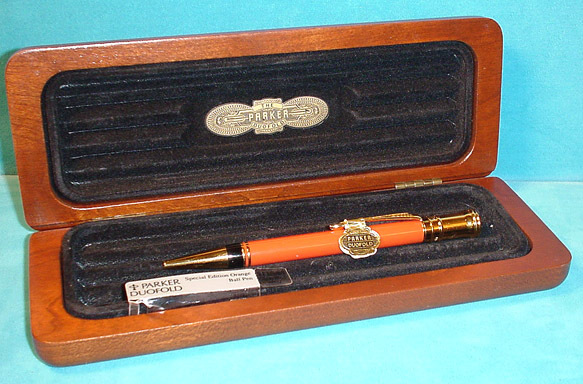 What you do get is a piece of Conklin history, in it’s original leather case and box (great graphics) and guarantee-service instructions. New-old-stock in original box (Photo). Ask about the special price for all five pieces (none are duplicates). 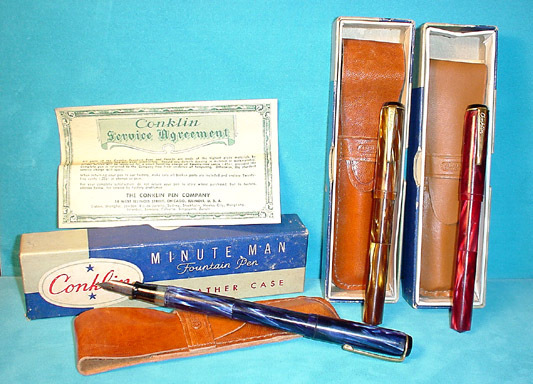 1945 Conklin Minuteman #3 size Plunger Fill in Blue Pearl. See Item above for description. 1945 Conklin Minuteman #3 size Plunger Fill in Golden Pearl. See Item above for description. 1945 Conklin (Penman) Penman #3 size in Khaki. GPT. Identical to the Conklins above, except for trim. Not identified anywhere as Conklin. See Item above for more description. New-old-stock, mint in original pouch (with U.S. Army Insignia), box and instructions (Photo). 1925 Diamond Medal #8 LF in Woodgrain Hard Rubber. GFT. 14K signed Diamond Medal nib. Top of cap has a service emblem — looks like an oriental “R” in a sunburst. Medium-fine nib. Near Mint. 1929 Diamond Medal #2 VP LF in Burgundy Marble. GFT. Unusual vest-pocket model with pointed cap and rounded bottom. 14K Diamond Medal medium-fine nib. A tad of clip ball brassing, otherwise near mint. 1905 Eagle I am offering this group of three Eagles; a glass cartridge fill; a coin fill, and a lever fill. They are restored but left with their original patinas. Each is all metal. 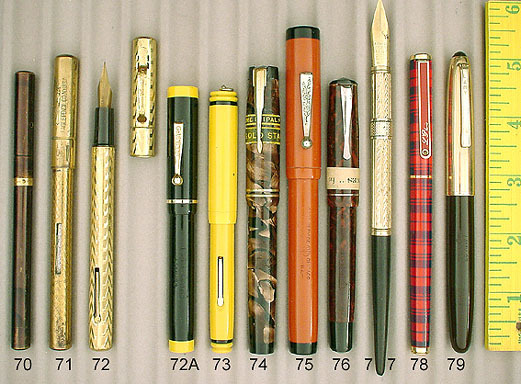 The original glass cartridge is still in the pen. All excellent. 1910 Eagle Coin fill pen for above group. 1915 Eagle Lever Fill pen for above group. 1927 Gold Bond (Unsigned) #2 LF ring-top in Mandarin Yellow. Knurled ends are set off with Black bands (beautiful). GFT. Fine, triple-flexible nib. A bit of lever brassing, otherwise near mint. 1939 Gold Starry #6 LF in Red Marble. GFT. Manufactured by one of the most important French manufacturers. 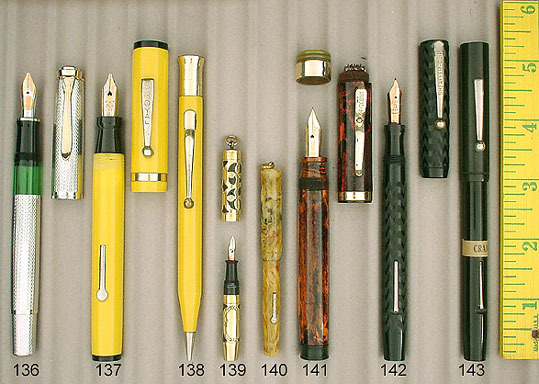 Medium, flexible, italic nib marked ‘Triple GS 1st Quality.’ New-old-stock with original label. 1925 Good Service #8 size LF in Cardinal. GFT. 14K Warranted #5 Medium, extra-flexible, italic nib. Near mint. 1929 James #4 size in Red & Black Mottled Plastic. NPT. Made by a small French company — very odd to find in the USA. Medium nib. Mint with original label. 1930 LeBoeuf #2 LF Set in Golden Tiger’s Eye Pearltex. Incredibly beautiful! GFT. Medium, extra-flexible nib. Near mint. 1930 LeBoeuf Pencil for above Set. 1915 Montblanc Traveling Ink Bottle in BHR. Quite rare! The Montblanc imprint is a little worn, but is fully readable. These came in many shapes and sizes – all are rare! 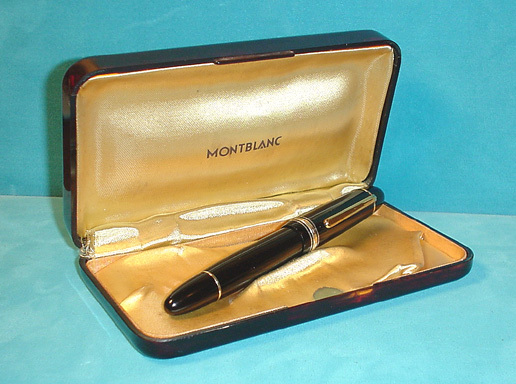 1950 Montblanc 744 PIF in Gold Filled. Wave Pinstripe pattern. Extremely rare, and almost impossible to find ding free, like this one. Extra-broad, flexible, italic nib. Near mint. 1955 Montblanc 342 PIF in Burgundy (very rare color). GFT. Medium-broad, italic nib. Near mint. 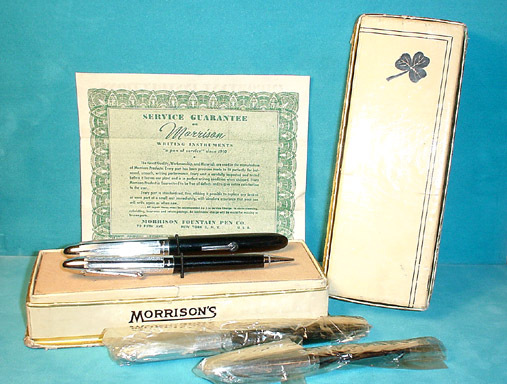 1955 Montblanc 281 Ball Pen for above Set. Mechanism activator is in the clip. 1958 Montblanc 344 PIF in Dark Blue (very rare color). GFT. Medium, flexible, italic nib. Near mint. 1959 Montblanc 149 PIF in Black Celluloid. Outer cap bands are Sterling Silver, while the rest of the trim is GF. Pen is near mint+ in its original tortoise box (Photo). Visualated barrel. Fine, flexible nib. 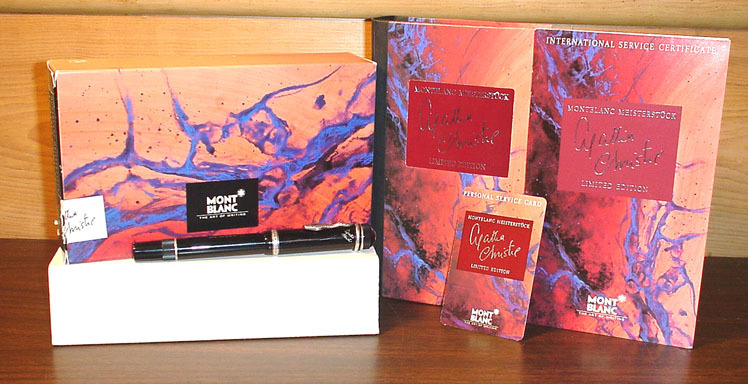 1994 Montblanc Agatha Christie PIF Fountain Pen Limited Edition. New-old-stock, mint in original box with all papers (Photo). Medium nib. 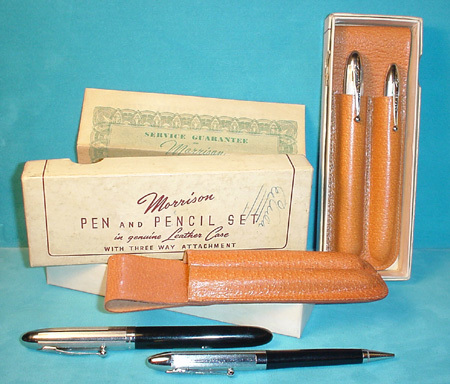 1948 Morrison Pencil for above set. 1927 National Pen (Signed) #3 LF in Fire Engine Red. Set off with knurled, black ends. GFT. 14K medium, flexible Warranted nib. Near mint. 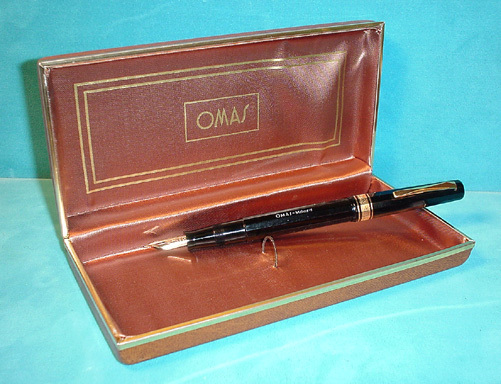 1927 National Pen (Unsigned) #8 LF in Red & Black “Woodgrain” design. Set off with Black ends. GFT. 14K medium-broad, flexible Warranted nib. Barrel imprinted: “Arrow Carrier Corporation.” Near mint. 1963 Papermate Pencil for above Set. 1930 Parker Duofold Juniorette BF Set in Burgundy. GFT. 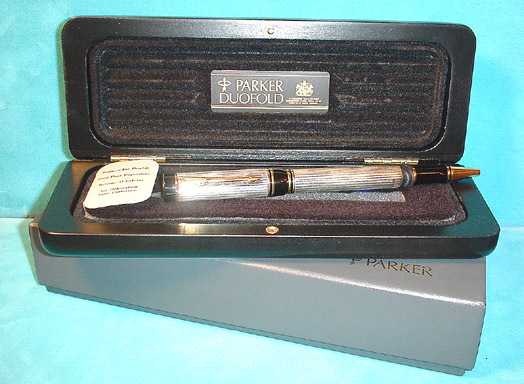 Serial numbered Duofold nib (so your pen could be identified by the nib). Some brassing of the bottom band, and slight imprint wear. Extra-smooth, medium nib. Excellent. 1937 Parker Royal Deluxe Challenger BF in Red Herringbone. GFT. Wonderful “Sword” Clip! Broad point. 1941 Parker Duofold Jr BF in Gold & Black Herringbone Streamline (very rare). GFT. Extra-broad nib. A tad of brassing to the clip ball, otherwise near mint. 1948 Parker Vacumatic Pencil in Grey Shadowave. NPT. Near mint. 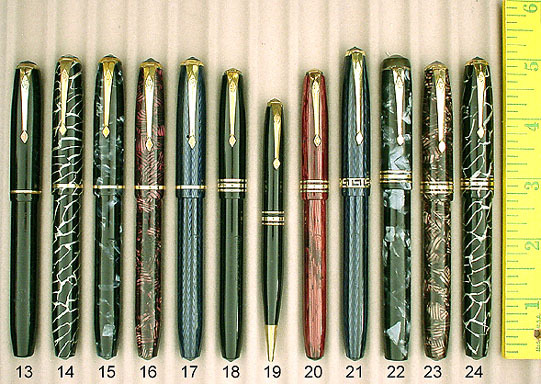 1952 Parker Parker 51 Aerometric in Green. Lustraloy (Stainless Steel) cap. Medium nib. A tad of cap wear just at the bottom of the clip, otherwise near mint. 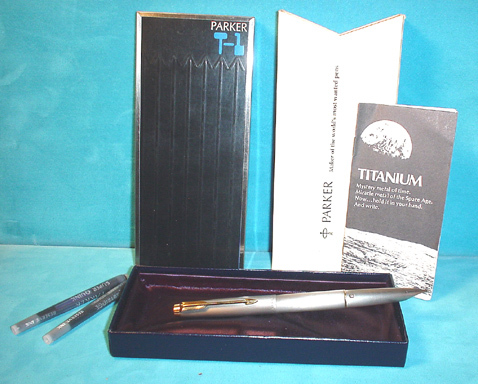 1970 Parker T-1 Felt-Tip (or Roller Ball) in Dark Brushed Finished. GFT. New-old-stock. Mint in original form fitted box with compartment for additional refill (Photo). Box has “Titanium” label. 1966 Pelikan MK 30 PIF Set in Black with Rolled Gold pinstriped cap. Broad, Oblique nib (shaped like left foot). New-old-stock. Mint in original box (Photo). 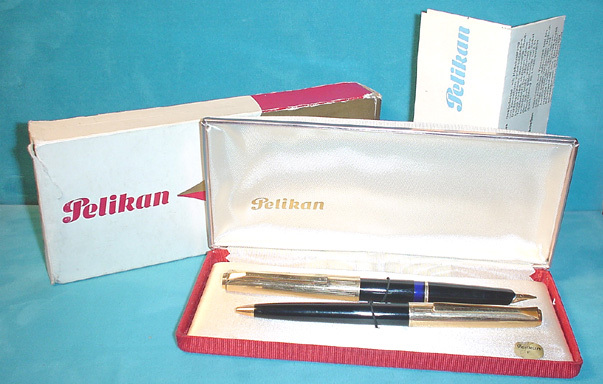 1966 Pelikan Ball Pen for above Set. 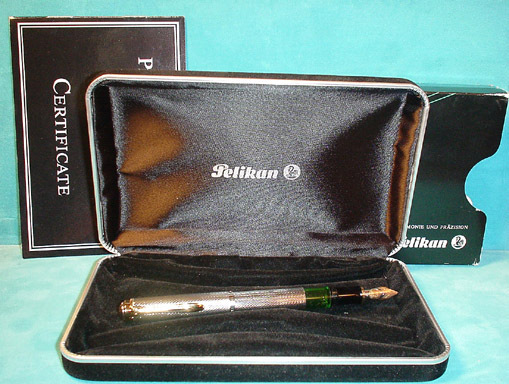 1983 Pelikan M730 PIF Sovereign Jubilee Anniversary Limited Edition, celebrating Pelikan’s 150th Anniversary. Broad nib. New-old-stock. Mint in original box (Photo). 1920 Salz Brothers “Peter Pan” ED in 1/10 18K Gold Filled Overlay. “Filigree” pattern. Fine, flexible nib. Hard rubber is just very slightly oxidized, otherwise near mint. 1928 Security Giant (#8 size) Twist-fill in Red Mottled Hard Rubber. Under the jade Bakelite crown is the check protector, used to perforate checks so their dollar amount couldn’t be changed (an early precursor to Internet fraud!). Fine point. One hint of crazing in the crown, and a tad of brassing to the edges of the band at the rear of the cap, otherwise near mint. 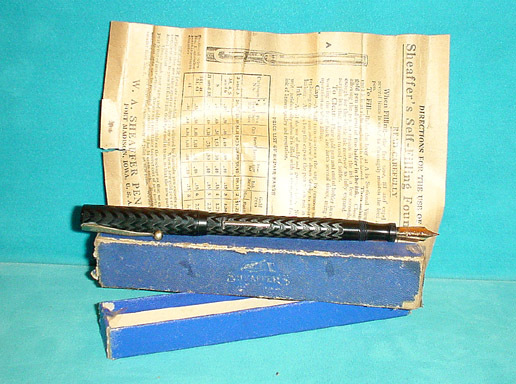 1920 Sheaffer #3 LF in BCHR. NPT. 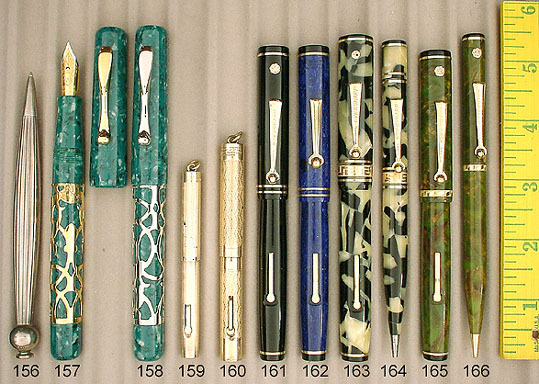 Clip imprinted: "Sheaffer-Clip." Quite early and wonderful condition. Medium, flexible, italic nib. Near mint+ in original box with original instructions (Photo). 1932 Sheaffer (Craig) #3 Craig LF in BHR. NPT. Near mint with original label. 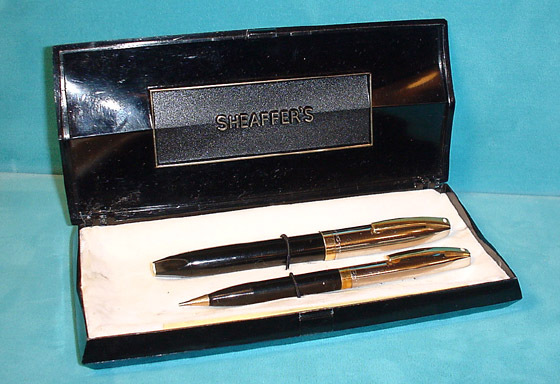 Sheaffer’s son’s name was Craig. 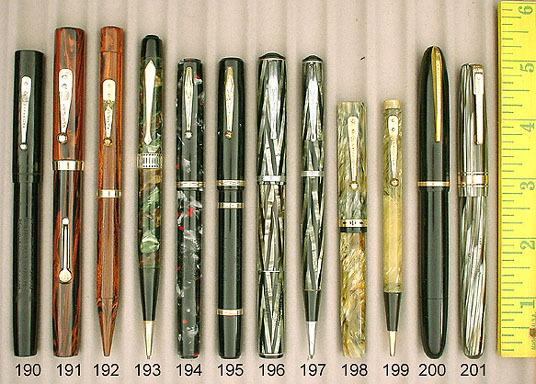 Walter used the Craig label to market new models which he didn’t yet want associated with the Sheaffer name. Very rare, especially in this condition. 1959 Sheaffer PFM IV Set in Black with Polished Chrome Caps. GFT. Fine Point. Near mint in original box (Photo). 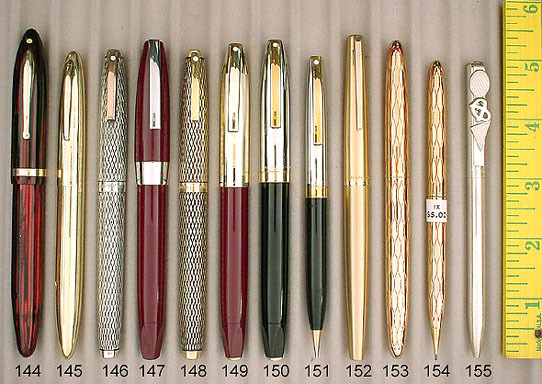 1959 Sheaffer Pencil for above Set. 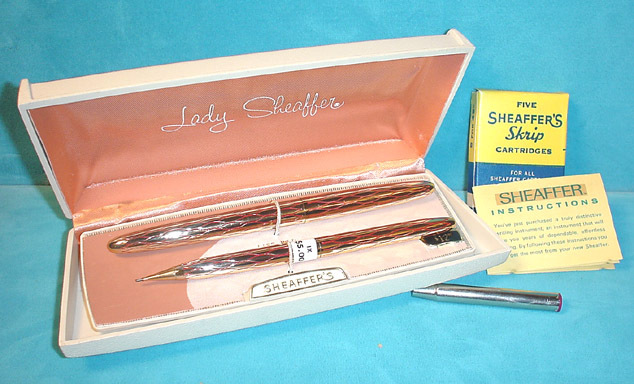 1969 Sheaffer Lady Sheaffer IX cartridge/converter Set in Gold Plate with red inlaid design. Mint with original decal, in original box with instructions, cartridges and converter (Photo). Medium nib. New-old-stock. 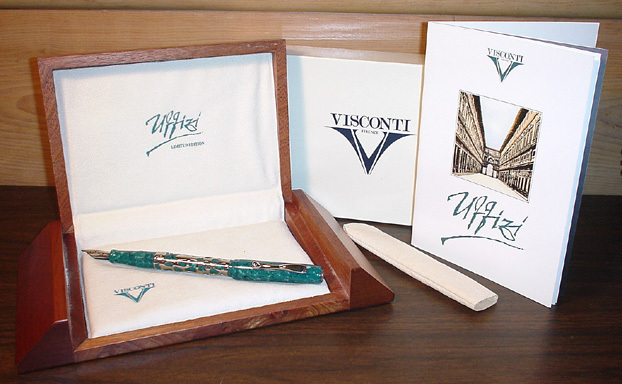 1993 Visconti Florence Uffizi Museum LE 150/400 in Jade Green with Sterling Silver Filigree Overlay. New-old-stock. Mint in box with Papers (Photo). Medium nib. Buy with matched model above for $2,000. 1920 W’Eversharp #2 LF in Gold Filled. Wave Chased pattern. Medium, extra-flexible, italic nib. Near mint. 1927 W’Eversharp Pencil for above Set. 1934 W’Eversharp Pencil for above Set. 1934 W’Eversharp Bantam Bulb Fill in Black. GFT. Medium Nib. Near Mint. 1934 W’Eversharp Bantam Bulb Fill in Blue Pearl Swirl. GFT. Medium Nib. Near Mint. 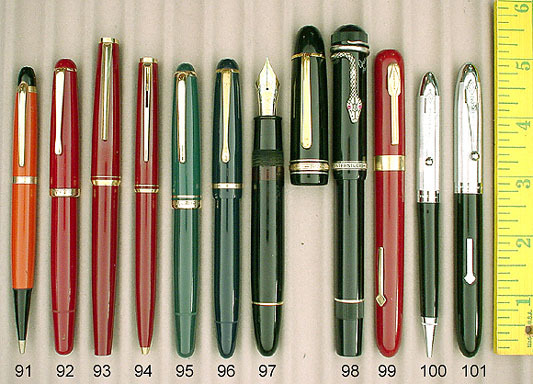 1934 W’Eversharp Equipoised LF in Flamingo (deep red). Rare color! GFT. Fine, triple-flexible nib! A tad of clip ball brassing, otherwise near mint. 1935 W’Eversharp Doric Silver Seal LF Set in Blue Marble Web. CPT. Adjustable nib! Near mint. 1935 W’Eversharp Repeater pencil for above Set. 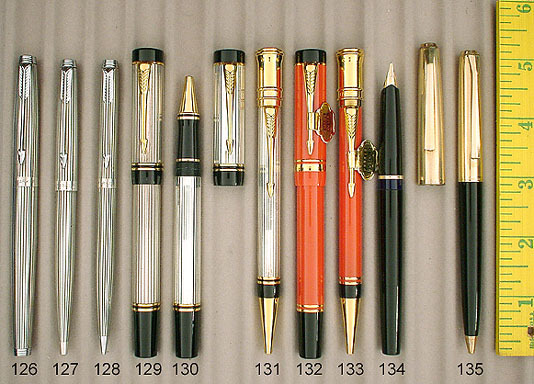 1945 W’Eversharp Skyline LF Set in Black with Stainless Steel Caps (Very rare). Medium nib. Near mint. 1945 W’Eversharp Pencil for above Set. 1900 Waterman #402 Straight Holder in Sterling Silver overlay. Hand Engraved Vine Pattern. 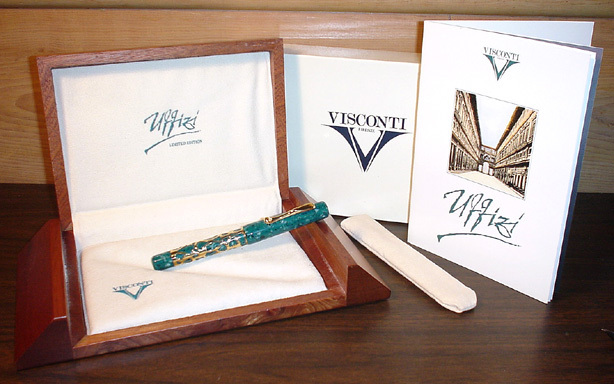 European Hallmarked, signed Waterman overlay. Indicia engraved in script “ER Xmas 1913.” Near mint+. 1917 Waterman #42 Continental Safety in 18 K Rolled Gold. Alternating vertical panels of (A) Chased diamonds, & (B) Flowers & Vines on a very fine barley background. Cap matches barrel. Repousse floral clip. Smooth derby. Near mint. 1917 Waterman #42 Continental Safety in 18 K Rolled Gold. Alt Vertical panels of (A) 2 engine turned wave chased stripes, (B) plain, & (C) 10 pinstripes with repeating “fishes” formed within the pinstripes. Plain derby. Floral & flower repousse clip. Near mint. 1917 Waterman #452 1/2V LF in “Art Deco” pattern. Rare and beautiful pattern. Barrel fully covered. Medium, triple-flexible nib. Initials "SF" on border by cap crown. Near mint. 1923 Waterman #72 ED in BCHR. 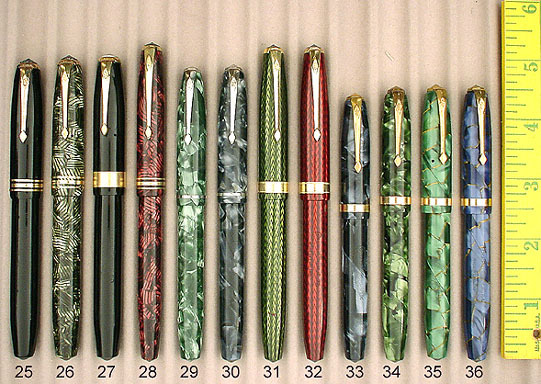 Rare model (Waterman’s 7X series are eyedropper fill pens with screw caps. 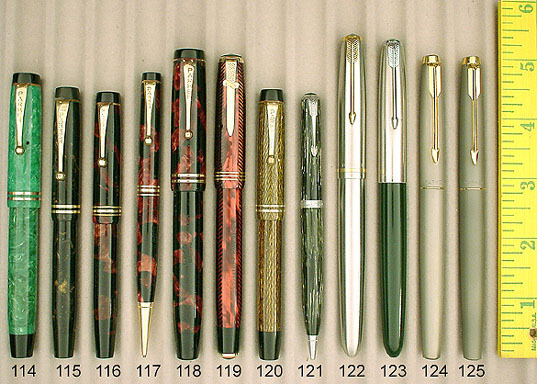 Lever fill pens had been introduced, but some customers would have no part of these “new-fangled” self-fillers, and still wanted eye-dropper filled pens). NP Clip. Fine, extra-flexible nib. Near mint. 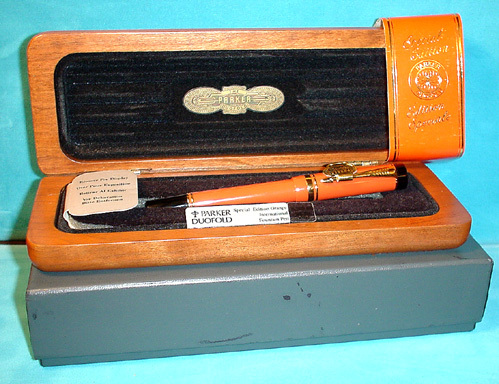 1925 Waterman #55 LF in Woodgrain. GFT. 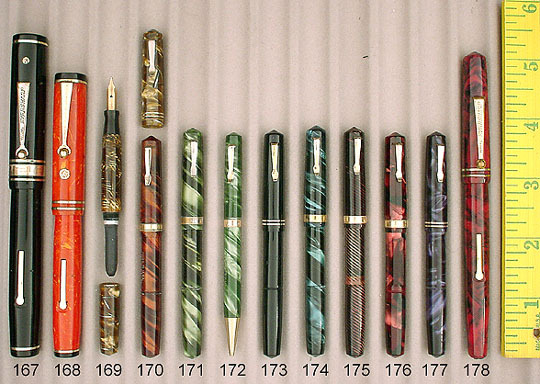 The Woodgrain pattern is rarer than the “Ripple” pattern. Medium, triple-flexible nib. Some imprint wear (fully readable) otherwise near mint. See “Special” with matching pencil below. 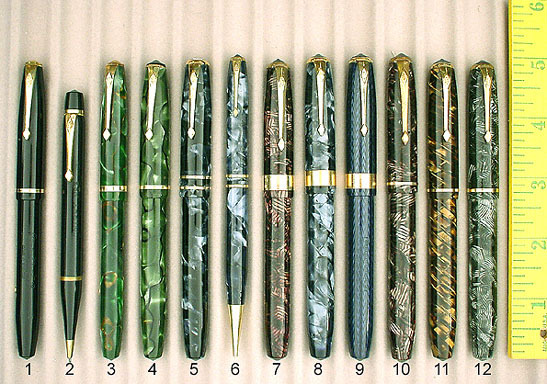 1929 Waterman Patrician Pencil in Moss Agate. GFT. A tad of brassing to the very edge of the clip, otherwise near mint. 1931 Waterman #32 in BHR. GF Trim. Rare model with “diamond-arrow” chased bands on both cap and barrel. Broad, flexible, italic nib. Near mint. 1935 Waterman Ink View Standard LF Set in Silver Ray. NPT. 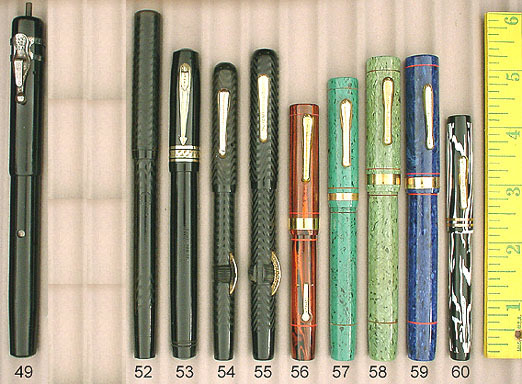 Waterman’s answer to the Parker Vacumatic, with a visualated barrel and multi-pump filler mechanism. Medium, flexible, italic nib. Near mint. 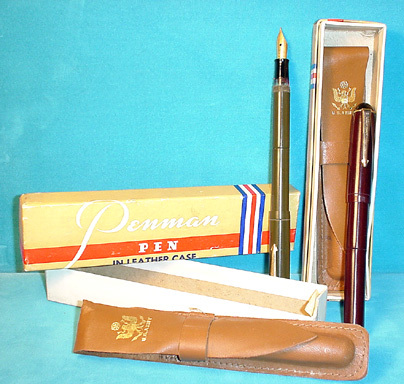 1935 Waterman Pencil for above set. 1936 Waterman #52V LF Set in Persian. Rare color and model. GFT. Pencil is a shade lighter than the pen. Fine, extra-flexible nib. A tad of clip ball brassing, otherwise near mint. 1939 Waterman #2 size Cartridge Fill in Black. GFT. Rare model which uses glass cartridges (one included). Medium nib. Over-the-top “Soldier” Clip. Near mint.